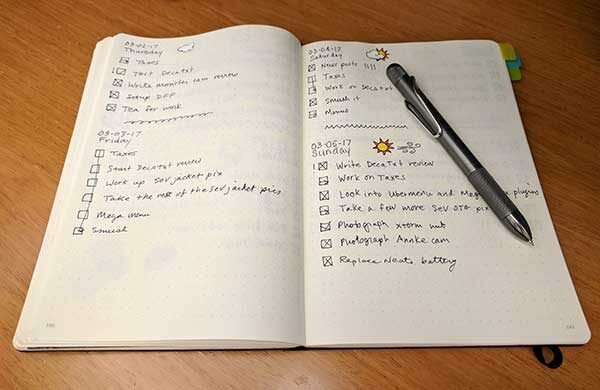 Whether it’s smartphones, wallets, pens and other gadgets, sometimes it’s a curse being The Gadgeteer because I’m never satisfied with what I have and am always chasing my next favorite thing. Ok who am I kidding, it’s freaking awesome being The Gadgeteer for that same exact reason. There’s always something new, better, faster and more awesome on the horizon and I get to check out a lot of those awesome things. Today’s new thing is The Pen from RIIND. Catchy name huh? But is it awesome? Let’s find out. First of all, you might be wondering how to pronounce RIIND. It’s pronounced the same as the rind of a watermelon. The Pen is just that, a pen. And although it writes like an ordinary ink pen, it has some not so ordinary features that set it apart from the eleventy billion other pens in the universe. 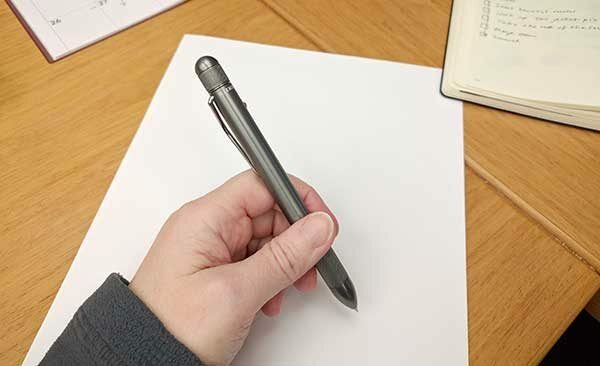 The Pen has a pleasing baton-like shape, with a rounded top and pointy tip. It’s made of anodized aluminum and is available in clear with a polished clip, gray with a polished clip (shown above), black with a polished clip, or black with a black clip. The Pen has a smooth satin finish that looks and feels great. A 1.25-inch long grip at the tip end of The Pen has a fine knurling that provides a perfect textured grip while remaining comfortable to hold for long writing sessions. One of the main features that make The Pen stand out from the crowd is its binary twist ContinuousCam mechanism that extends or retracts the tip with a half turn in either direction. That means you never have to think about how to open or close the pen because any way you turn it is the right way to do it. 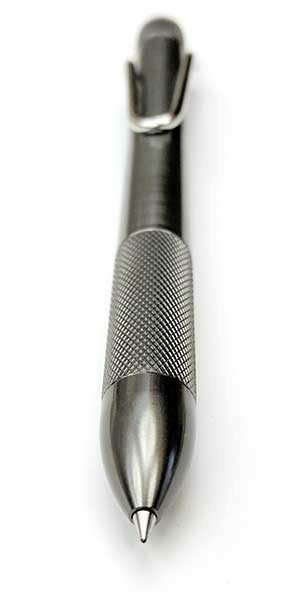 The mechanism feels smooth but rugged with no rattling when the tip is out or in. I really like the way it feels when you twist the end and the ink tip clunks into place. The other feature of The Pen that will cause people to ask you where you got it, is the super clip. It’s definitely noticeable with the shiny chrome finish. It’s not only made of robust material but its unique asymmetrical design allows the clip to open farther than any pen clip that I’ve seen before. That means you can clip the pen to almost anything and it will stay put. That said, I do wish that RIIND offered a version of The Pen without the clip because I don’t use that feature and would prefer the smooth look of the pen without the large clip shiny clip. Replacing refills is a non-issue with The Pen. Just unscrew the pen tip, remove the used cartridge, insert a new one, and replace the tip. The Pen is compatible with 35 different refills including my favorite, the Pilot G2 which comes with The Pen. You can see a list of compatible 110mm ink refills on their site. The Pen has great balance and the diameter of the grip is just right, so writing with The Pen feels comfortable even for long sessions. The Pen has a cool industrial look that really sets it apart from other pens I’ve recently reviewed. I really like this style although some people might think it looks a little too masculine. The Pen is manufactured in the US, has stand-out looks with unique features. If you like its industrial style and super clip and don’t mind the $99 price tag, I think The Pen would make a great EDC pen that should hold up for years and years of writing and doodling adventures. Source: The sample for this review was provided by RIIND. Please visit their site for more info. It looks great but the $99 causes heartburn!